Pete at Dragonchasers has a post up that goes straight to the heart of something that's been on my mind for quite a while. Talking about the different ways players approach both open-world games and MMOs he makes several astute observations, concluding that "one of the reasons MMOs don’t seem to be as ‘sticky’ any more is that they have so many convenience features that they no longer feel like virtual worlds". This is a view clearly shared by the development teams of two of this year's MMORPG "newcomers", Project : Gorgon and Shroud of the Avatar. I touched on this aspect of P:G yesterday, and Wilhelm observed in the comments that he was having similar feelings about SotA. I have SotA patched and ready to play. It has a generous free trial system that will most likely cover any interest I have. Even so, I'm far from excited about stepping into another new world. As with Project: Gorgon I suspect that getting the best out of Shroud of the Avatar will demand more of my time than I'm willing to give. Going back to the beginning of the 21st Century, virtual worlds, as we often called them then, required two commitments: time and money. You needed to buy the game and any expansions that appeared and you had to pay a monthly subscription. Just the right to log in whenever you wanted would run you a couple of hundred dollars a year. If you wanted value for that spend you'd also need to commit blocks of time and plenty of them. You wouldn't get much done in less than a couple of hours and you'd need to make room in your schedule for several of those sessions every week. It was commonplace for MMO players to rack up 30 or more hours after work and at weekends. Plenty managed a lot more than that. For a while the awe and wonder of the whole experience carried those commitments but new doesn't stay new forever. Novelty wears thin. There were plenty of complaints about timesinks and design flaws that cut into what many saw as the reason they were there in the first place - killing monsters and progressing their characters. One of the regular targets for improvement was travel. Pete recalls heated discussions on the subject: "Most people felt like fast travel was a real convenience and not having it was disrespectful of a player’s time. I thought that forcing players to travel through the world was a good way to keep them immersed in the world...". Back then, and for a long time afterwards, I would have agreed. In a way I still do. But only in a way. I think it's true that someone coming fresh to an open world MMO will find themselves becoming more invested if they explore it at a pace that equates with human scales of perception. It takes time to assimilate new information. The old school approach felt like moving to a new country and living there for a while until you learned the customs and the language. Travel in modern MMOs feels more like ariving at the airport and getting a brief glimpse of the city before being whisked off to your luxury hotel. Once you settle in you can select a new, fully catered trip to some scenic spot or activity of your choice: hop on the tour bus to destination Fun. On the face of it, the immersive experience should be superior in every respect. Only, all too often, it's not. It can be tedious, frustrating, dull, repetitive and boring. I suspect that even those of us who heartily support the "stop and smell the roses" approach secretly - or not so secretly - appreciate modern conveniences like Waypoints and flying mounts. There are good reasons. Going back to the vacation analogy, not too many people relish the set-up. The drive to the airport, parking the car, the shuttle bus, the wait in Departures, the flight itself, the taxi ride to the hotel... Yes, the first time you go away on your own those things all have their moments, as all new life experiences can, but once you know the routine it ceases to amuse or inform. The first few days or weeks in a new MMO can be exhillarating, compelling, absorbing. Plenty of people are more than willing to stop, look around them, take some time to explore. If they stick around, though, what was once an exciting journey of discovery becomes just another commute. Back in the day, those heated discussions over whether MMOs should have fast travel tended to favor veterans, who'd been there and done that, telling newcomers that they should eat their greens because it was good for them. The idea was that something ineffable would be lost if everyone could just get to where they needed to be the moment they wanted to be there. Of course, by this stage the veterans knew all the shortcuts and had all the available perks and benefits that might hurry things along. Journeyman's Boots and the Worker Sledgemallet were de rigeur for a reason. As Pete says, history has shown that fast travel was the more popular option. 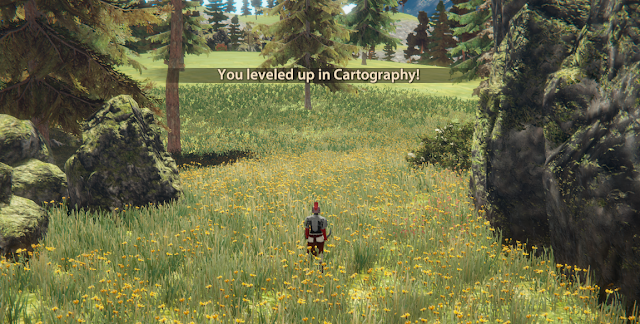 The same can be said of any number of other quality of life improvements, from exclamation points over questgivers' heads to the ability to sell anything from anywhere. Modern MMOs do indeed look like five star luxury hotels compared to the wilderness camping experience of classic EverQuest or the Youth Hostel basics of Vanilla WoW. Of late there's been a curious revival of interest in doing things the hard way, both from players and developers. Every MMO with anything that could be called a legacy seems keen to bring back the glory days with some kind of Classic Server. Players vociferously demand developers make things as close as possible to the original while developers try to balance rose-tinted nostalgia with historical reality. New entrants like the aforementioned Project: Gorgon and Shroud of the Avatar, as well as many more in development (Pantheon, Lucimia, Elyria et al) set out their stalls to attract players tired of having it all their own way. You won't appreciate it unless you have to work for it, or so the argument seems to go. Even popular, established MMOs bend towards the trend. Blizzard decided it would be good for WoW players to get off their flying mounts and walk. 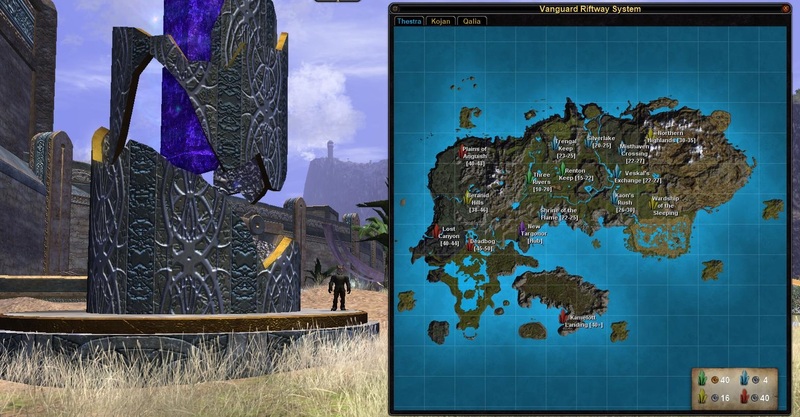 Daybreak thought EQ2 players would appreciate the extra immersion of no longer being able to see quest destinations marked on their maps. Is there any evidence that players appreciate the slight return? Not really. Blizzard had to retrench. 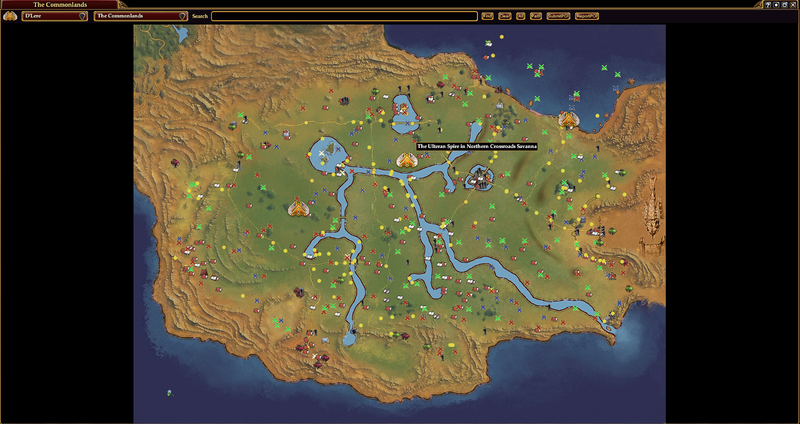 EQ2 players have the wiki up on a second screen. Trion had to increase Prime xp then triple it. Playing modern EverQuest on Vox, as I have been recently, has clarified my views on all of this. For years I've said one thing and done another. I've been a proponent of slow travel and of slow gameplay. Well, not any more. Oh, I still strongly advocate taking your time, exploring, getting to know every nook and cranny of the world. I still prefer traditional MMO combat that takes a while and lets you look around and assess the situation rather than crash-bang, hit all the buttons action gaming. I'm still looking for an immersive experience in a virtual world. I just don't believe that artificial obstacles and drag anchors encourage or enhance that experience. In fact, there's a simple rule-of-thumb I'd apply to check whether an in-game system genuinely improves my quality of life or not: if I could have it in the real world, would I want it? I certainly wouldn't want to have to travel into town to order something from Amazon, then travel in again to collect it. If I can sit at home and have things delivered to my door in real life, surely I should be able to do the same in a video game - especially in a world rich in magic. Or take the example of going on holiday - again. In June Mrs Bhagpuss and I are flying to Bilbao, hiring a car and driving across the top of Spain to explore north of the Portuguese border. If I could press a button and travel instantly from my home to the Hire Car depot, would I? Hell, yes! Driving the car around Spain is The Holiday. Getting there isn't. It's a chore. For other people, even exploring by road would be more trouble than they'd want to take and that's fine. If they just want to lie by the pool drinking cocktails, that's their business. Everyone has different lines when it comes to what they find entertaining. And video games are supposed to be entertainment. I'm all for player choice. 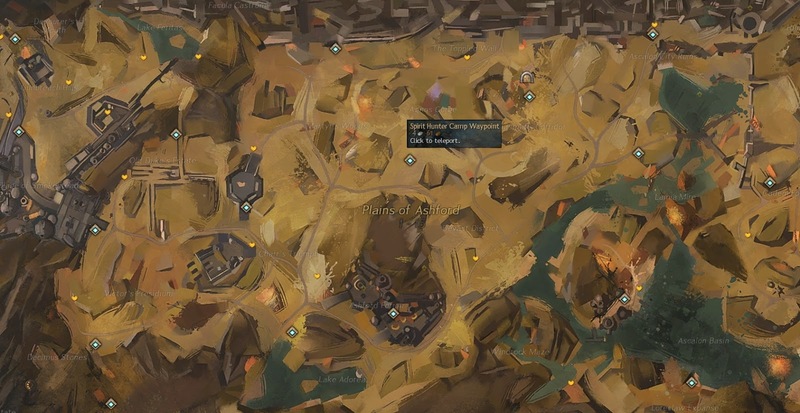 Opening your map and clicking Instant Travel shouldn't be the only option. You should always be able to walk to the dungeon entrance if that's what you want. There's even an argument for saying you should have to walk there once before you get the opt-out, although these days I'm not even sure that holds. Sure, I like doing it but that's no good reason to insist everyone else does. 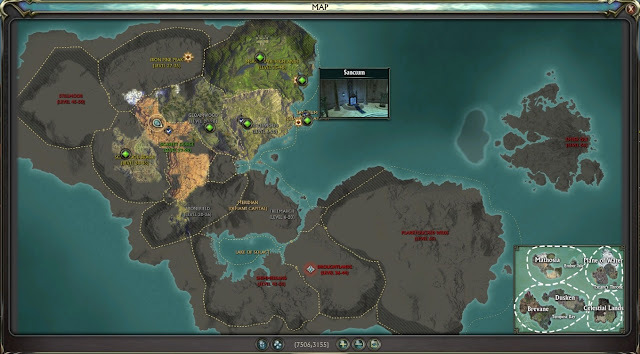 Going back to what Pete posted, by confining himself to single-player open world games, he neatly sidesteps the issue. Those are generally games you play once. It absolutely makes sense to take your time, see everythng, go everywhere. It's all fresh. It's all new. In an MMO it's very different. The first run from Qeynos to Freeport back in the day was an adrenaline-fueled thrill ride. The second, the third - still an adventure. By the time you came to do it the fifth or sixth time...well, that's how Druids and Wizards got rich. If fast travel has its merits then most of the other post-WoW shortcuts have become so essential and accepted we never even think about what it would be like withouit them. Well, if you play P:G or SotA you're going to get a rude reminder. And some people will love it, which is absolutely fine. Good for them. They should have MMOs that support and sustain the way they want to play. I may even join them once in a while, just for a bracing change of pace. Mostly, though, I'll keep my conveniences, thanks. It's not just that I feel I've paid my dues, that I deserve some slack. It's that the older I get, the more I value my time and the less inclined I feel to fritter it away on tedium. The key thing is whether or not it feels good. Is it fun? Am I being entertained? If the answer's yes, then it's time well spent. If not, then either it needs to stop or I'll stop playing. Smart MMO design should be able to offer acceptable options to meet a wide range of playstyles in the same game without anyone feeling short-changed. That's where we were going a few years ago and that's still where the mainstream is today. Just about. I have a niggling feeling the direction of travel may be shifting. It would be typical. Just when I align with the norm the norm decides to move. I guess we'll know for sure when WoW Classic finally appears. If it's genuinely old school and a massive hit, then buckle up your walking boots. There's going to be a whole lot of hiking in all our virtual futures. GW2 taught me that travel could be too convenient with how mounts ruin Vanilla zones. Not only they are too fast, not only they let you skip most of the obstacles that are designed for multiple small jumps, not springer's 20 meteres high, but their attacking skills are also too strong. Creating infinite invisible walls (which don't really help, breaking out of the map boundaries is too common nowadays) should've told Arena.net to at least try to reconsider the decision. GW2's mounts are a total mess. Allowing gliders in the old world worked well but Mounts really jumps the shark. I don't care because for me GW2 jumped the shark sometime around November 2012 but it's an extreme example of the complete disregard to internal logic that long, long ago reduced GW2 to what Graham Greene would have called an "entertainment". I don't really count Mounts as travel conveniences, though. They're more of a style accessory. I generally find it quicker and easier to WP, run and glide than to use a mount. I love the option of mounts in the GW2 old world, but not like I adore the fun of gliders. I use gliders when I can because it's so enjoyable, I only break out the springer when I'm going somewhere and don't feel interested in the tedium of old school platforming. Such as a daily vista that I've done many times before and I'm in a hurry. Those who are more enchanted with platforming, and such, are free to feel otherwise and I won't criticize them for choosing not to use a springer which would bypass a part of the game that they enjoy. To me, the old world zones have been out for years, and I don't see a reason to avoid the convenience of mounts if I'm in a hurry covering terrain that I've passed many times before, often on multiple characters. However, sometimes I'm feeling old school and I do eschew the mounts for a more classic feeling session. Fast travel removes the World, as distance is *felt* by travel time. Two locations connected by a teleport are "next door", as you just have to pass through that glowing doorway and you're there. All WoW instances are "everywhere" as you can enter wherever they are. World is a defining feature of MMOs, for better or worse. Remove it by fast travel and you get a lobby game. It's like removing aiming from an FPS. Aiming is often annoying. But it's no longer an FPS if you have autoaim feature. I completely agree with that. It's exactly true. As with most truths, though, it's not the only truth. MMOs have to be so many things at the same time - games, chat rooms, hobbies - virtual worlds is just one role they have to play. There absolutely is a place - an essential, necessary place - for MMOs that put their virtual worldliness ahead of everything else. That's just a type of MMO, though. It's the type I wanted twenty years ago. I still wanted it ten years ago. Now? I'm not sure. I guess if the world is sufficiently well-imagined then, yes, I'd still be in for all the inconvenience a true virtual world entails. Until someone comes up with one that's good enough, though, I think I'm done with that. If that means gussied-up lobby games that are still amusing and entertaining then that's going to have to do. For now. Thanks for the post! I can definitely see both sides. As I've gotten older I have more time to play (and sadly less money to spend) so puttering around works well for me and extends the time I spend with a game. But that's mostly single player games. 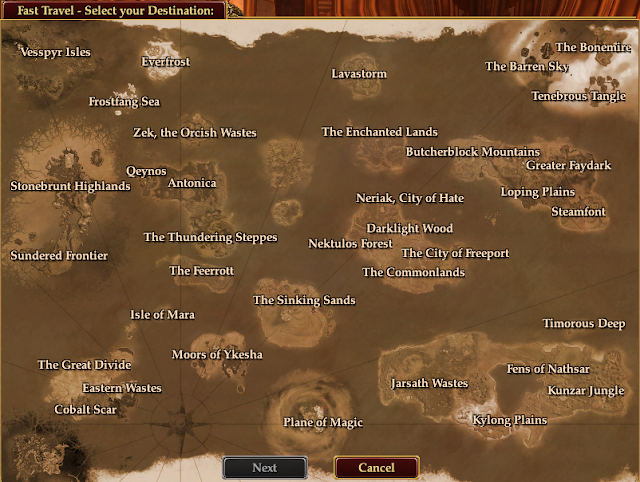 Do you think that removing travel times has hurt community in MMOs? I just remember doing a lot of chatting as I was traveling from one place to another. Of course I remember doing a lot of chatting as I meditated to recover mana in EQ and I don't think I'd want to go back to that. I guess I just miss those moments when you're going from this town to that dungeon and along the way you run into some other players struggling with a tough enemy and you stop to help them and start chatting and wind up going off on a tangent. But I will freely admit this might all be rose-tinted glasses. I think the major difference between Then and Now when it comes to community in MMOs is that back then playing an MMO was analogous to joining a Social Network today. Outside of IT workplaces and academia, most people didn't chat to other people around the world via the internet. MMOs made that possible and it seemed magical. Nowadays that's just completely ordinary and there are a million places better than MMOs to do it. Even back then, a lot of people chatted because they had nothing better to occupy their attention. There was a lot of downtime in the gameplay and often it was either impractical or not permitted by the rules of the game to tab out to another screen. Few people had a second device available. I used to keep a book open on my lap to read whule I medded when I played EQ. 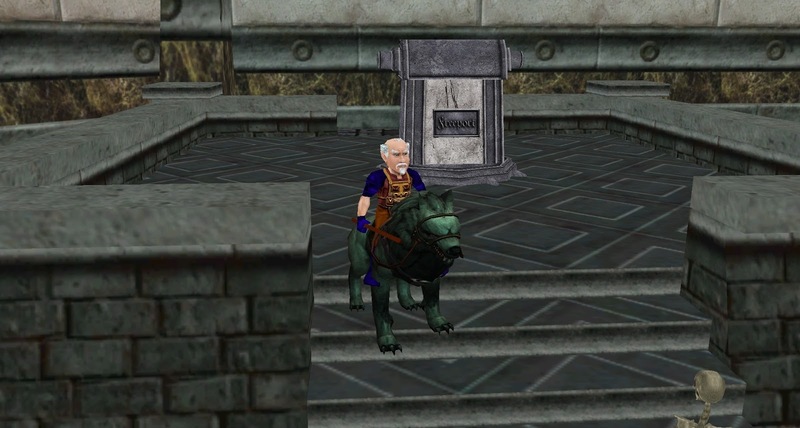 You could see the writing on the wall when SOE added the "Gems" mini-game to EQ. Everyone played it to the point that clerics missed heals and people got kicked from groups for paying more attention to their Gems high score than the dungeon or raid they were in. If we'd had smart phones at the same time we'd had that amount of downtime I think the genre would have imploded. If I could press a button and travel instantly from my home to the Hire Car depot, would I? Hell, yes! I find the question of quick travel endlessly fascinating, and like you I have to admit that there's a bit of a difference between theory and practice. Good question! I love Spain and so does Mrs Bhagpuss. I've been going there pretty much at least once a year for more than fifty years. I know Spain far better than I know Great Britain in that I've been to every major city except those in Cantabria and Asturias, most of the smaller ones, many of the really small ones and a lot of villages! I've driven all over the country, hitchhiked, traveled around by train and bus and even done some fairly long walks... and even so I won't get to see everything I want to see before I get too old to travel. Well, maybe if, as we often talk about doing, we move there for a few years. That said, it is specifically the long travel times that put me off going to North and South America, both of which I'd love to visit. If I could zap there instantly I would definitely want to do it. So it would make for some interesting choices. I think you're 100% right on the turning adventure into having a job thing. Token systems are one of my pet hates in MMOs. I've mentioned before that I first encountered it when Darkness Falls came to DAOC. I hated it it then and I haven't warmed to it since.